After many wonderful years with our BigMamaDood we said our very sad goodbye to this incredible friend. 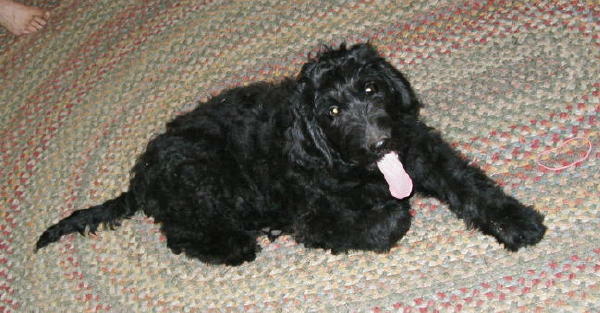 Zeitel was our first dood and was the inspiration for us to begin breeding goldendoodles nearly 10 years ago. Once Zeitel came into our lives we just couldn't get enough of these delightful creatures. She made us laugh until we cried which we did right to the end. 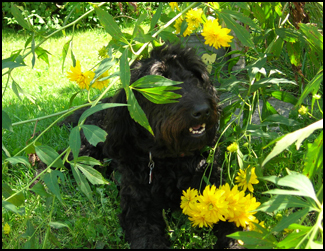 Zeitel was our "goofdoodle", Bill's forever fishing buddy, the queen mother of all doods, our protectress, a wonderful mama to three litters, and the "BigMamaDood" who watched over countless pups that passed through our kitchen. After she finished having her own pups she assumed the role of guardian protector for all pups that entered in. She didn't want them to come near her but she always parked herself where she could keep watch over the litter. If any of the other dogs played too roughly and a pup yipped Zeitel would rise to her feet to make her presence felt. If the rambunctious offenders didn't listen she would give a growl and they knew immediately that they had stepped over the limit. She is deeply missed and we give her a daily nod as we pass by her resting spot on our doodlejaunt up the mountain. Thank you Zeitel. You are not forgotten.